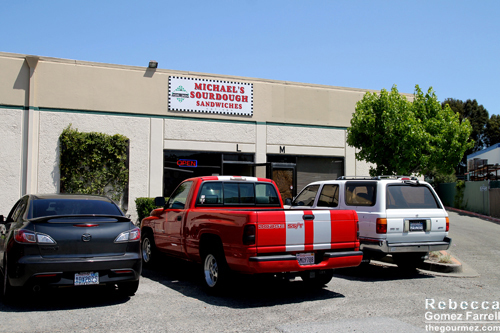 Michael’s Sourdough is a small chain in Marin and Sonoma counties that specializes in giant sandwiches featuring their signature, fresh-baked sourdough rolls. Most of their meats are also hand-roasted, which is a huge undertaking for a sandwich shop in a small space, so applause! I’m guessing they have a central kitchen somewhere to pull that off. 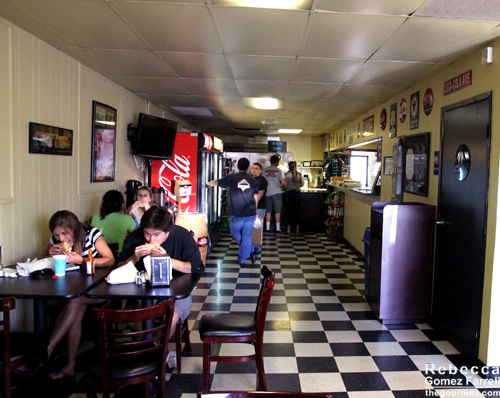 Their San Rafael shop is in a more industrial section of town, but that didn’t stop the whole parking lot from being filled just past the typical lunch hours. Indoor seating only, and framed vintage posters advertising the Pacific Northwest decorate the walls. Place your order with the cooks on the right of the long, narrow room. They’ll write it on your plate, and the cashier will call out whoever’s order is finished first to pay. Drinks in the fridges. Pick up a giant pickle if you want for an extra charge. 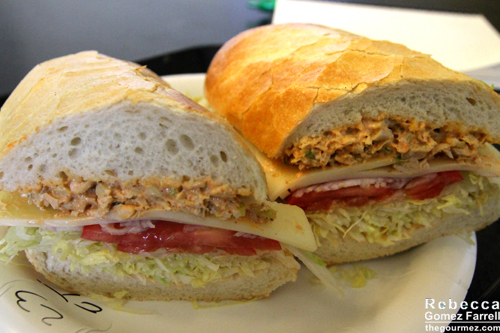 I ordered the chicken salad sandwich–on their sourdough, of course. I love when chicken salad recipes get creative, and Michael’s paprika-heavy one fit the bill. It also tasted strongly of leeks and/or celery, which added a lot of flavor to what can often be a bland choice–I pick it because I love mayo, y’all, not because I expect the chicken salad to blow my mind with boldness. Luckily, Michael’s delivered on both counts. But the sourdough was not as memorable. Maybe my expectations were too high? I thought I’d be impressed by its sourness, but it wasn’t much different from a soft French roll. The crust had a good crunch. All toppings were thinly sliced except the shredded iceberg lettuce, which is always fun for a change. The rest was swiss cheese, mustard (which I refused), lettuce, tomato, and red onion. A satisfying sandwich with a unique chicken salad filling, but I wanted more thrill from the hyped-up bread.